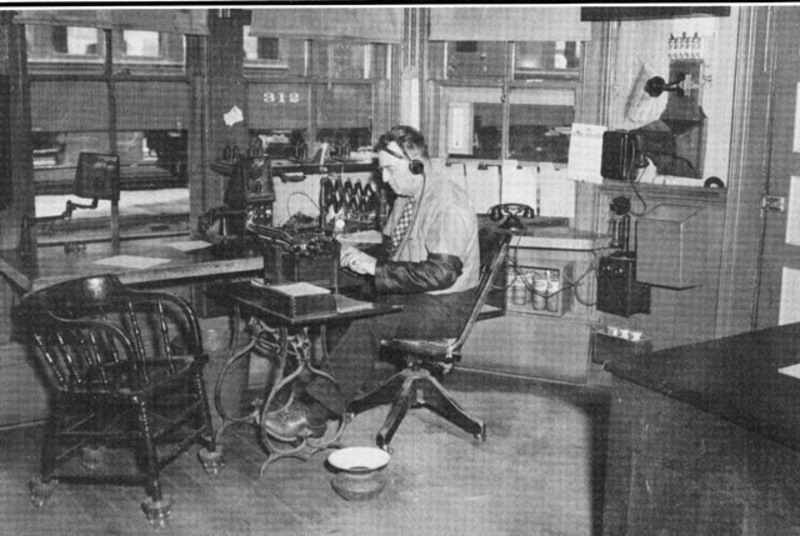 I'm looking for any old photos showing a railroad telegraph office where one can clearly see a three wire cordless jack box on the desk. I'm looking for photos of actual installations back in the days, not modern museum displays as I have some of those. Unfortunately what with slow film speeds back then photos taken inside the offices of small railway stations are rare and ones showing cordless jack boxes, at least so far, seemingly almost unavailable. Any help would be appreciated. As you say, good pics of depot telegraph office interiors are very hard to come by, especially those showing telegraph table details. I could have some others tucked away, if I find I will send. One is the Durango, Colorado NG RR depot office, circa 1948. Cordless Jackbox under shelf where mainline sounders are located. 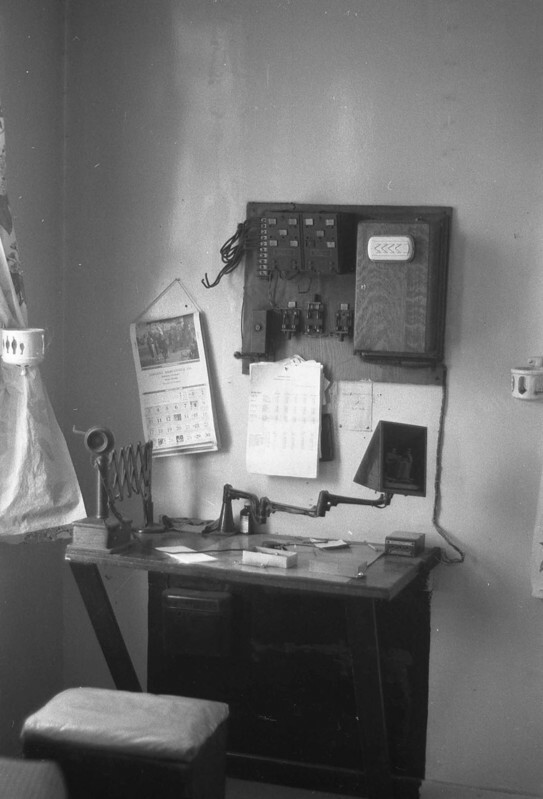 Other shot is of the telegraph desk at the Cumbres Pass,CO RR section house circa 1968 on the D&RGW narrow gauge. It was built by the D&RGW telecomm maintainers in Pueblo, CO and installed there after depot torn down, and personally observed by me in about 1967. Here is another for your file. I'm not sure which tower this photo came from, but one can see a jack box on the operating desk. Thank you for asking the question about cordless jack boxes. ( I worked with a lot of them) between 1950 and 1961. The image of the Durango,Colorado Depot Office Ú 1948 Ú sent you by Ed Trump,AK was a little bit like receiving a letter from home!!! 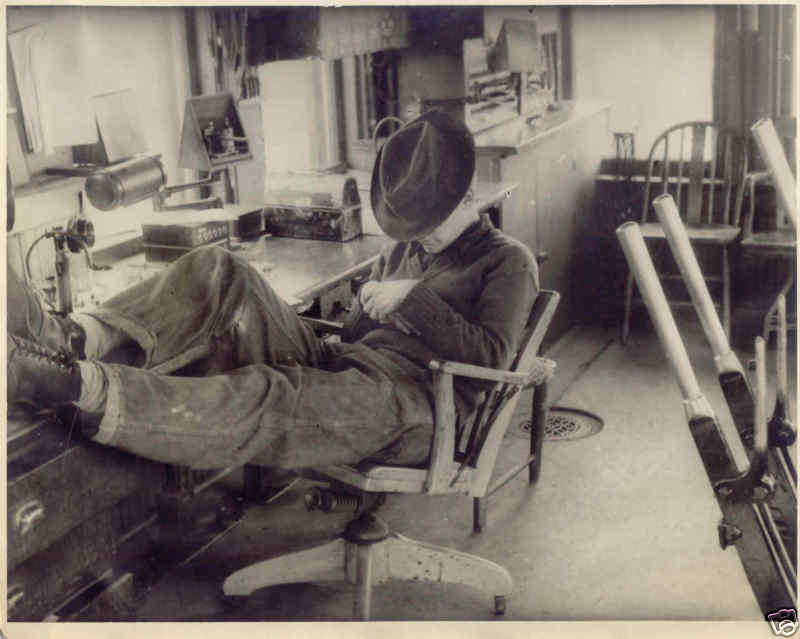 As a teenager in 1947 and 1948, I was ôworking on the Railroadõ and in numerous Railway Depots. Durango Depot Office had a greater variety of office equipment etc than the offices I was in during that period. In 1951, I worked a CNR City Depot at Brantford until 1957 that had more !!! It is nice to see the old style chairs with the glass telegraph insulators for feet, plus old phones - telegraph and dry cell batteries!!! This picture from James Wades of a Telegraph Operator in a Mechanical Lever Tower brings back memories! Between 1951 and 1957 Ú ( Brantford City Depot) I worked a midnight shift Ú and ôaby satõ an old early 1900 Electric Interlocking Plant! The first thing to catch my eye was the ôLUNCH BUCKETõ Ú Those old metal lunch boxes in the 1950Ès would hold lots of food plus a thermos of ôhot beverageõ. It was common in early days before the 1960Ès to see railroaders carrying lunch buckets!!! I ate a lot of meals out of those lunch buckets in the ôwee hoursõ of the morning at the Brantford City Depot. We worked a straight 8 hours and ate on the job!!! - was common in the 1930Ès and 1940Ès on the CNR Trains and Office Depots. I recall riding in the old wooden coaches on a MIXED TRAIN with my father Ú which had a separate ô smoking compartmentõ for men. It also had a number of spittoons for men who chewed tobacco!!! Two station offices on the line had spittoons. One Agent chewed tobacco and the other used SNUFF!!!! on public notice and invited interested parties to comment on what the League has called "minimal but necessary changes" to 80 and 75 meters. The ARRL petitioned the FCC to fix a "shortfall in available RTTY/data spectrum" that the Commission created when it reapportioned 80 and 75 meters 10 years ago. The League's petition asked the FCC to shift the boundary between the 80 meter RTTY/data subband and the 75 meter phone/image subband from 3600 kHz to 3650 kHz. The proposed change received strong support from ARRL members, and the ARRL Board of Directors adopted it as policy at its July 2015 meeting. At that time the Board also agreed to seek RTTY and data privileges for Novice and Technician licensees within their current 15 meter CW subband, and to do the same on 80 meters, depending on the outcome of the 80/75 meter subband revision. * Modify the RTTY/data subband, so that it extends from 3500 kHz to 3650 kHz. * Modify the phone/image subband, so that it extends from 3650 kHz to 4000 kHz. * Make 3600-3650 kHz available for General and Advanced Class licensees, as was the case prior to 2006. * Make 3600-3650 kHz available to Novice and Technician licensees for telegraphy - consistent with existing rules permitting Novices and Technicians to operate CW in the 80, 40, and 15 meter General and Advanced RTTY/data subbands. * Modify the rules governing automatically controlled digital stations (ACDS), to shift the ACDS segment from 3585-3600 kHz to 3600-3615 kHz, consistent with the IARU Region 1 and 2 band plans. According to the ARRL, the FCC R&O in Docket 04-140 released in 2006 departed substantially and without justification from the rules proposed in the FCC's so-called "Omnibus" Notice of Proposed Rule Making (NPRM), with respect to 75 and 80 meters. Among other actions, the resulting changes expanded voice privileges on additional frequencies in various bands, including 75 meters. The FCC shifted the phone/image subband from 3750-4000 kHz to 3600-4000 kHz, trimming the 80 meter RTTY/data subband from 3500-3750 kHz to3500-3600 kHz and substantially changing "the entire dynamic of this band," the League said. [N1MMLoggerplus] Command to change radio power level? I did some searching/doc reading and it doesn't look like this is possible, but I thought I would ask anyway. I am able to run full power (100 watts) on all bands for RTTY except 40 meters, on which I can only run 40 watts or RF will get into my soundcard/PC/radio/something and lock it up. Normally, I do a pretty good job of remembering to dial back the power when I go to 40 meters, but sometimes I don't. Also, with an FT-950, one must go into a menu setting, dial the power down or up, then save the menu setting...a little more tedious than just a knob on the front panel. Does N1MM+ have any functionality to send a custom macro/CAT command (provided I can find the correct one) to change radio settings, such as power? Michael--sorry if you've already tried this--but I think in the long run, you'd be well-served to investigate the source of the lock-up, rather than dodge it by lowering power. I had multiple issues, too, and cured it with ferrites or torroids in the audio and RF chains. Jim Brown, K9YC, has written extensively about this issue. A Special THANK YOU to SKCC OPS!! A huge thank you to all of the SKCC stations who came out last week for the NOVICE RIG ROUNDUP! This was the first year that we got it posted on the SKCC Calendar and encouraged SKCC ops to give it a try, even if they were not running an old NOVICE era rig. Thankfully many of them participated. Next year promises to be even better, with a 9 day event to cover two full weekends, and also there will be 50 BONUS POINTS for every contact with a WN or KN station!! The 2016 results, soapbox and winners will be posted soon. See you there in February 2017 !! Amazon.com sells a serial to usb interface. You should go to "advanced" under serial ports in the control panel and see which ports are in use. I had to delete all the ports reported in use but didn't show and reboot. This site worked for me for the same problem you described. I was using Windows 8.1 but the fix should also work with Windows 10. --to the best of my knowledge, Windows 10 is known to be very aggressive with Soundcards and with Prolific drivers. I'd say that the majority of problems that Hams are having with their Ham programs not working with Windows 10 are because of Soundcard and/or Prolific driver problems. In the case of Prolific drivers, the old advice of "the latest drivers are the best" no longer work for Windows 10; things may "look" good in Device Manager for your devices (i.e. no yellow triangles, etc), but Windows lies!! (4) If you can't find an older version of the Prolific driver, I might still have what I had downloaded and I could send it to you. Info on prolific drivers can be found on the Miklor.com website. with info on the older drivers for the fake chips. Also have them for windows xp users. At 6:22 you will see Hank Svard's side swiper advertisement behind the Telex machine. 73, BCNU on the SSN! Yann, F5LAW. Part 3 "DF-Antenna USA Variant"